Five young players have been nominated for the Premier League 2 Player of the Month award for March. The attacking midfielder scored a stunning free-kick in a 2-0 win over Swansea City as Everton maintained a chance of retaining the PL2 Division 1 title. Evans, 19, also featured in the round of 16 of the PL Cup. Barnes produced two goals and an assist in a 4-0 win over Liverpool that meant Leicester City replaced the Reds at the top of Division 1. The 20-year-old also helped the Foxes reach the PL Cup quarter-finals by beating Southampton by the same scoreline. The right-back, who made his senior PL debut this season, featured in three Division 2 matches for Stoke City, who moved away from the bottom two with a 2-0 win at Newcastle United. The 19-year-old forward played twice in PL2 in the month as title-chasing Swansea City collected two Division 1 wins, including a 3-1 victory over Leicester. The goalkeeper played in all his side’s Division 2 matches as West Bromwich Albion ended a three-match losing streak with a draw against Stoke. 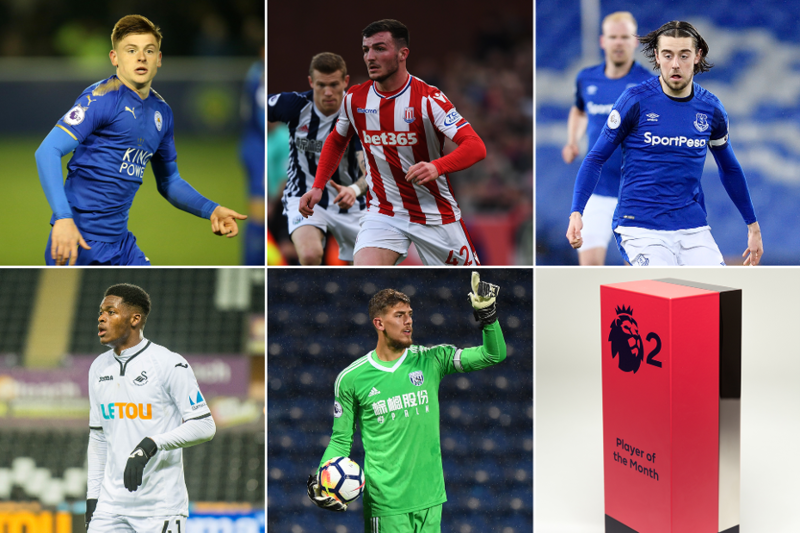 The shortlist is decided after PL2 club coaches pick the best performances by an opponent in their league matches, then selected by the Premier League Football Development Panel. The panel will also choose the winner, to be announced on Friday, 13 April.